Opioids are drugs that relieve pain. 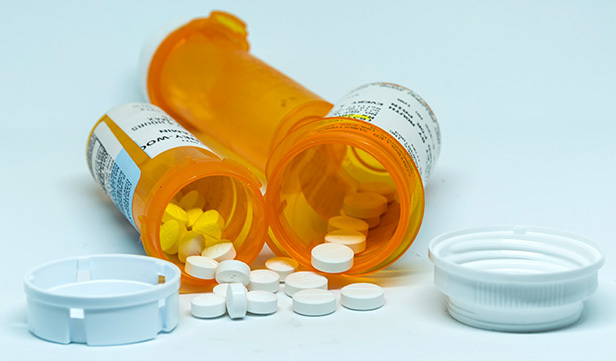 Prescription opioids are medications that doctors use to treat moderate to severe pain after surgery or injury or for health conditions like cancer. Common prescription opioids include oxycodone (OxyContin®), hydrocodone (Vicodin®), morphine, and methadone. Other types of opioids include fentanyl, a synthetic opioid pain reliever, and heroin, an illegal drug. According to the Centers for Disease Control and Prevention, prescription opioids can have a number of side effects, even when taken as directed. Over time, some people develop tolerance for an opioid, so they need to take more of the medication for the same pain relief. Physical dependence is another side effect and includes symptoms of withdrawal when someone stops taking the medication. The most serious problem of all, however, is that using prescription opioids can lead to addiction, abuse, and overdose. Every day, emergency departments across America treat more than 1,000 people for misusing prescription opioids. Too many of us are unaware of the risks of opioid addiction, while others become addicted while following doctor’s orders. Two million Americans are addicted to prescription narcotics. One in five users who start on a 10-day supply of opioid medication become long-term users. Nearly half of patients who take opiate painkillers for more than 30 days in the first year continue to use them for three years or longer. Up to 70% of abused prescription medications come from family and friends. Six out of every 10 American households have unused opioids. For those who overdose, the median time from first opioid prescription to overdose is just more than two-and-a-half years. Almost everyone knows somebody who has used an opioid. Chances are, the prescription was for more medication than they needed. Recent years have seen a dramatic increase in the use of prescription opioids to treat chronic back pain and osteoarthritis, despite the serious risks. It’s all too common to hear stories about people taking opioid medications after fracturing a bone or having a dental procedure. Excess medication can be dangerous to your health and increase the risk of addiction. It also provides easy access for those who want to abuse opioids. Despite prescribing guidelines and clinical research, overprescribing continues to fuel an epidemic that grows worse each day. To combat the overprescription of opioids, the Centers for Disease Control and Prevention has developed guidelines for prescribing opioids for chronic pain. If your doctor is prescribing an opioid for the first time, ask about the potential risks of taking the medication, especially if you have a history of addiction. If you’ve taken opioids before, talk to your doctor about how they affected you. Your doctor can also determine if you have any conditions that could increase the risk of side effects. Opioids are easy to misuse, so it’s really important to follow the directions for taking them. If you take other medications or drink alcohol, ask your doctor about possible interactions. And, learn how to properly dispose of unused medications so others in your household don’t use them. People who take opioids for chronic pain should discuss this with their surgeon and anesthesiologist before having surgery. Opioids can increase the risk of complications from surgery. If your doctor prescribes an opioid after you have surgery, take the medication only as long as necessary for pain relief. If you’re still in pain a few weeks after surgery, talk to a pain specialist about other options for pain control. Opioids don’t always control pain. Ask your doctor if a different treatment might be right for you. For example, you may be able to manage your pain by combining medication with other methods of pain relief. Talk to a pain specialist about what options for pain control might be best for you. Non-drug therapies include meditation, acupuncture, physical rehabilitation, lifestyle changes, nerve blocks, and more.